Spending a day (or multiple days) at Disney, whether that be Disneyland or Disney World, takes planning in general. Doing Disney with toddlers? Well, that’s a whole other thing! 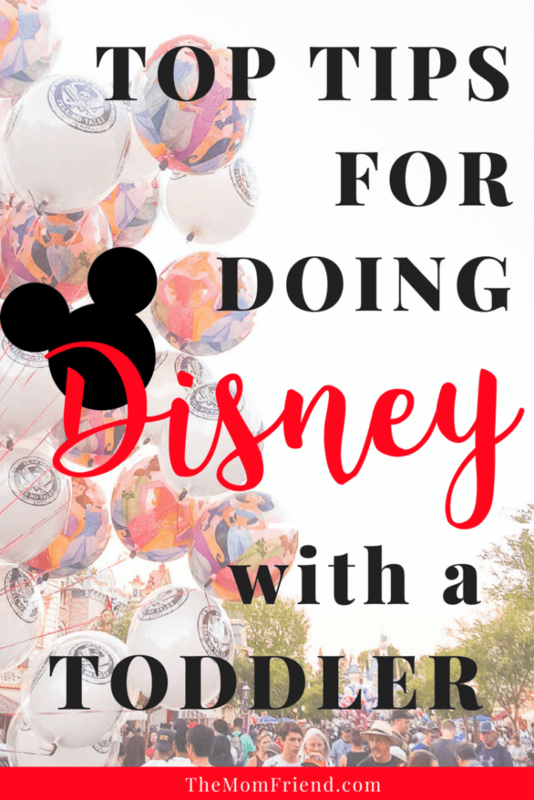 There are so many great resources out there to plan a trip for taking toddlers to Disney (like these great tips I rounded up from over 20 of my blogger friends), but it is always helpful to read more! When Charlie was 20 months old, we took a week-long vacation to California to spend time with my side of the family. We decided that even though it was a 6 hour drive away, what a better way to end the trip than taking Charlie to Disneyland for the first time! Growing up in the Central Valley in CA, my family went to Disneyland every few years. It was our major vacation growing up and left me with so many special memories. We decided to fly out of LA instead of Northern CA, and convinced my parents to go with us (though it didn’t take much convincing). See my tip below as to why this was one of the best decisions we made! With tickets purchased, I set out to plan the best one-day at Disneyland that we could possibly have. We had such a fun day, and even though we encountered a few hiccups, it was such a magical day! 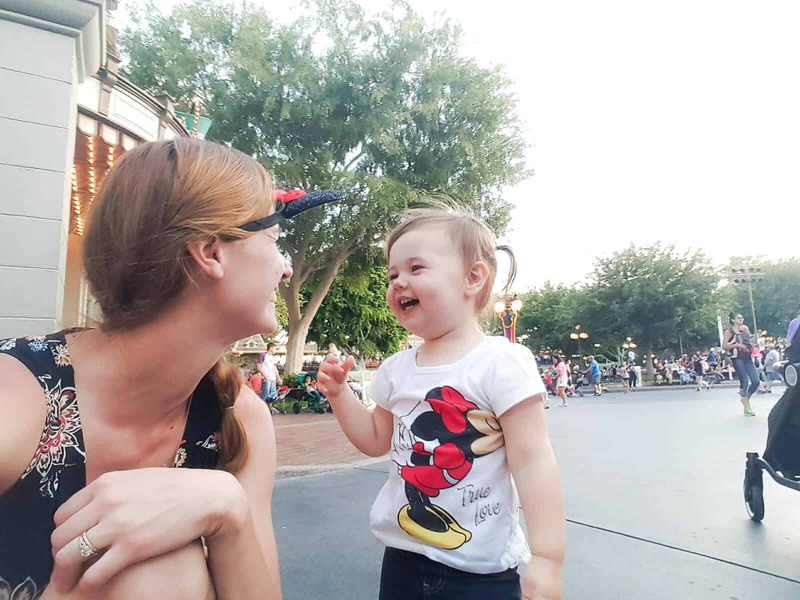 We definitely plan on going back, and doing Disney World with her, but for now, here are my top tips for doing Disney with a 1 or 2-year-old or young toddler. In this post I will cover tips for doing Disney in general, plus a few specifics to Disneyland. Since the Magic Kingdom (where we spent our day) is similar in both places, these tips will work whether you go! Disney is huge, so I knew there was NO WAY we were going to do everything in one day. We decided to focus our time just in the Magic Kingdom, as opposed to getting a Park Hopper pass and doing California Adventure too (even though it is so fun!). There is still much more than can be accomplished in one days time, so I knew I needed to set a few goals for the day and make the most of our time. For us, that meant just exposing Charlie to the magic of Disney and letting her experience as much as she could, and wanted to. Rides and character meet and greets would be great, but knowing that she is fairly shy when in new situations and around lots of people, I didn’t want to overwhelm her or set up huge expectations for photos and hitting everything on a list (see #8). Our plan was to hit Fantasyland first since that had the most rides we were interested in, make sure to find Mickey and Minnie for a photo, catch a parade, and let the adults ride a few favorites too. Of course, I had lots of other things I was hoping would be able to happy, but knowing there were just a few major items to check off the list made the day relaxing and easily manageable. I honestly don’t know how my parents did Disney back in the 80s and 90s without this app. We downloaded the Disneyland Mobile App (you can get the My Disney Experience app for Disney World here instead), and it was a serious game changer. You can do everything with this app, from tickets and park maps/information, to reserving FastPasses and Dining Reservations. The best part was being able to see all of the rides and attractions, AND THE WAIT TIMES! This made the day so much easier. Rather than heading across the park just to decide that an hour wait is too long for something, all we had to do was pull up the interactive map and see exactly how long the wait was. This helped us so much, because the last thing we wanted to do with a toddler was waiting in long lines. Plus you can see where characters are, and even find PhotoPass Photographers. We were also there the week that the Disneyland App launched the FastPass feature called Disney MaxPass, allowing guests to digitally select FastPasses without having to go to the attraction for a ticket. It cost $10 a day per guest, but was so worth it. By purchasing MaxPass, we were able to link our entire group and have one person reserve FastPasses for everyone, PLUS we got unlimited PhotoPass downloads—meaning all of the photos park photographers took of us were ours to keep and share! Not having to run around the park and getting to keep the memories forever made it so worth it—my dad kept remarking how much easier it was than when he had gone just a few months prior. 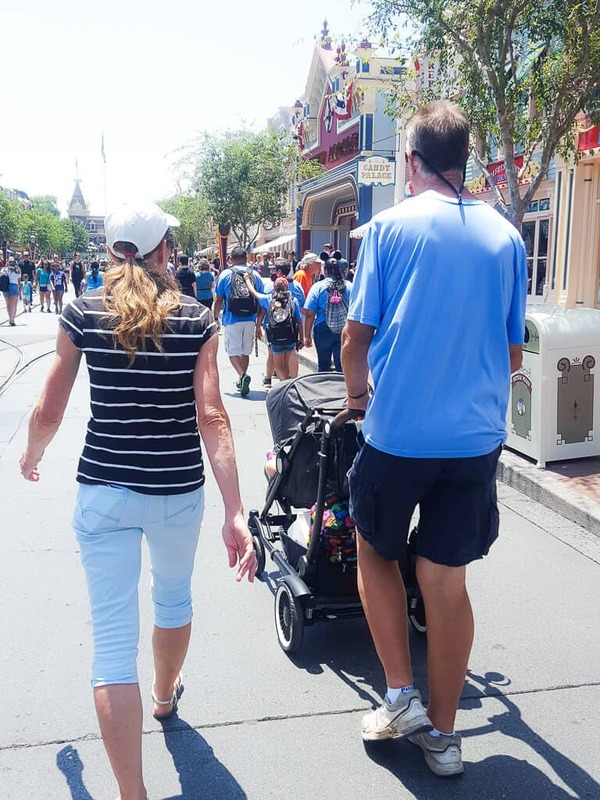 If you are doing Disney with an infant or toddler, a good stroller is a must-have. We clocked in a total of 13 miles one that one day (including in the park and walking to and from our hotel), and there is no way I would have been able to carry Charlie when she got tired for even part of that time. We took our Austlen Entourage to Disneyland with us, and it was a dream to have. 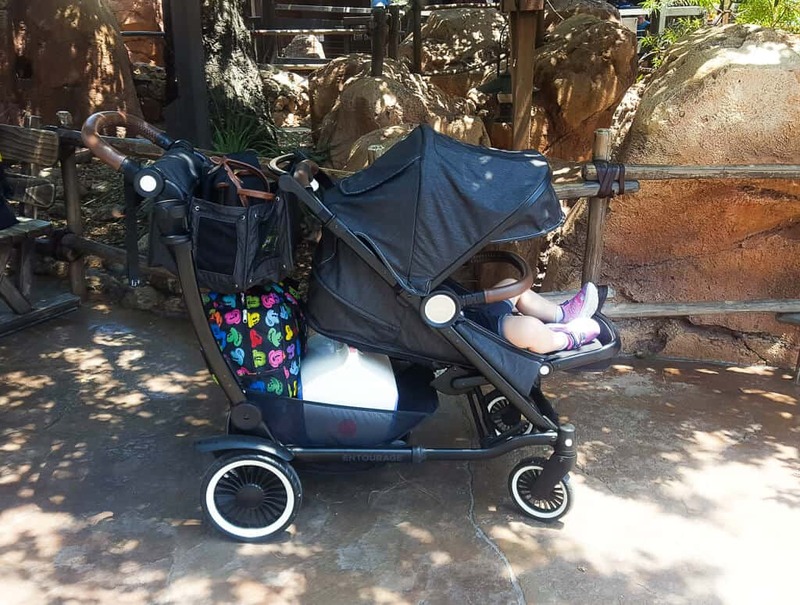 I have a full reveiw of using the Austlen Entourage at Disney here, but some of the best features to look for in a stroller is a good recline for naps on the go, a large sunshade, great storage capacity, and comfort for pushing it all day over all those miles. The Entourage was the perfect stroller for the day—we were able to bring everything we could have wanted into the park (and could have brought much more), and didn’t have to carry anything (except for taking a small bag for when on rides). Find out why it was so good here. 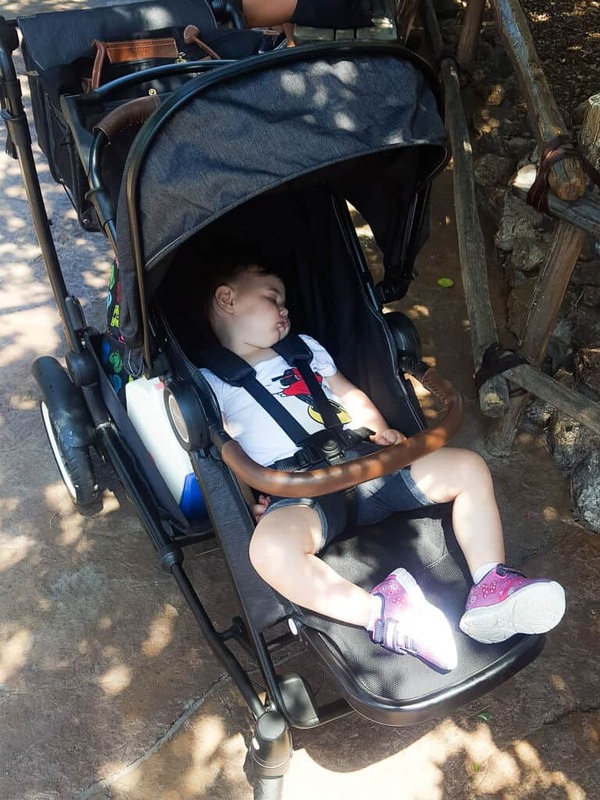 Charlie also fell asleep in the stroller mid-day and again later at night, which allowed us to stay at the park until closing—something we weren’t expecting to do but it was a nice treat at the end! Since we had so much storage space in our stroller, I wasn’t worried about being limited on what we could bring into the park. However everything brought meant extra weight to push, so I wanted to be mindful of what we packed and make sure we were prepared for the day. Packing smart is the easiest way to prepare for a day at the park with toddlers—beacuse you never know what will happen with them! We packed a cooler with drinks (including milk for Charlie and sodas/water for adults) and snacks, and brought other things to munch on during the day. I knew we would grab food in the park too throughout the day (Churros—yum!) but wanted to have enough on hand to limit how much we had to stop and spend. This post has lots of great advice about what to pack, and how to use reusable water bottles to keep everyone hydrated in the park for free! Now that you are prepared for the day, let’s really get into how to make it a fun day at Disney with Toddlers! Remember how we made a plan? We planned to head to Fantasyland first and hit up Peter Pan’s Flight, since that is one of the most popular rides at the park. That would have been great, but we also found something else that made the day start off even smarter! 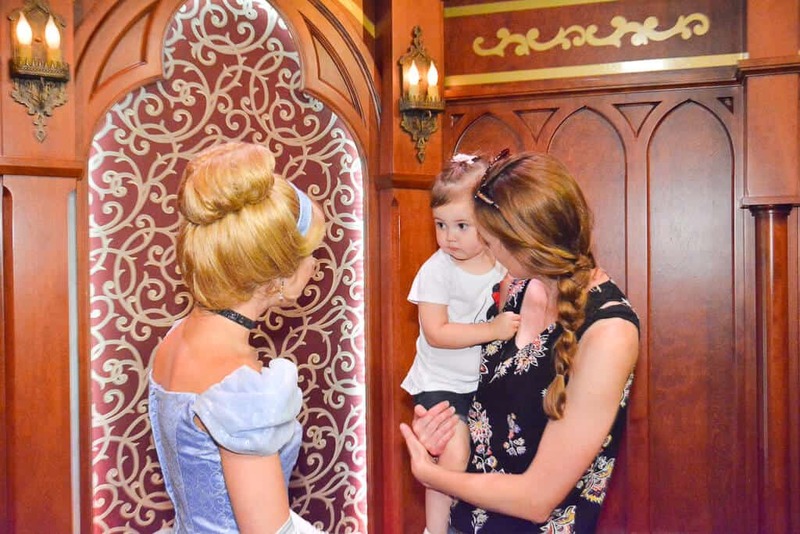 If you are unsure if your toddler will like the characters, then I would highly recommend starting off with a character attraction that will end up with long lines later. We were passing the Royal Hall (next to the Castle) and noticed it was open but that there was no line. 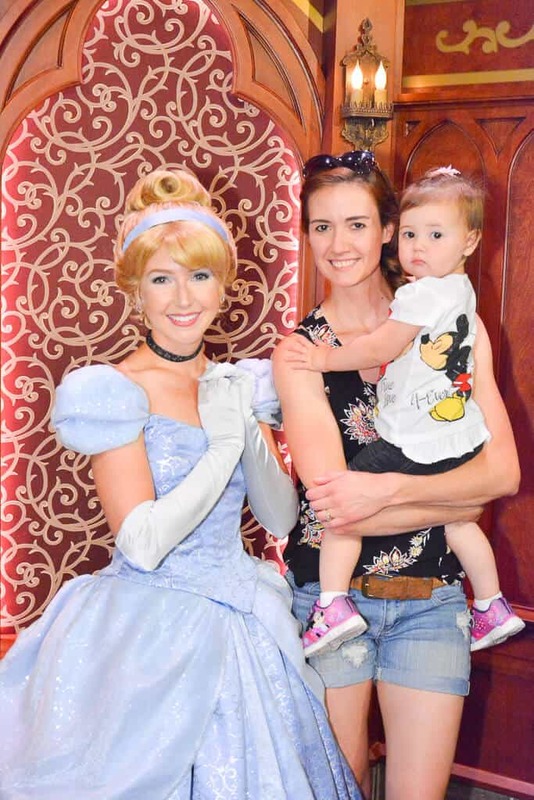 I hadn’t planned on taking Charlie to see the princesses if it required waiting in a line, but we were able to see 3 of them in less than 5 minutes on our way to Fantasyland. Charlie was so shy and unsure of them, but they were all super sweet and tried to engage with her anyways. I’m so glad we didn’t wait in line for them, because Charlie ended up only liking characters from afar! Tip: Pick 1 or 2 things that would be a great test or starting point, and head to that first. The best part of the day was that we were not rushed to try to cram everything in and make memories of doing it all. We took our time in the park, and casually took in the day—with zero expectations of behavior and without feeling like we had to check lots of things off of a list. As a result we had a fun, relaxing (though super tiring) day, and actually ended up going on so many more rides and attractions than we anticipated. Knowing we only had one day at the park however, we wanted to try to stay as late as we could to allow time to see the fireworks and to enjoy the full day (and ticket price!). We booked a hotel about a mile away from the park on the bus route, and planned for a mid-day nap (for everyone!). Charlie ended up falling asleep while I was waiting in line for Thunder Mountain Railroad with my dad and hubby (even though we had FastPasses, the ride broke down right as we got in line!). Luckily she slept the entire walk back to the hotel and then stayed asleep in her stroller at the hotel for a nice full nap! 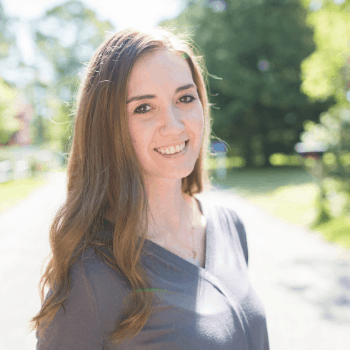 While some people may prefer to just keep chugging along all day and let kids nap on the go, having a break was something we adults needed too, and it kept us relaxed and able to enjoy the full experience. Flexibility is like the life with toddlers mantra isn’t it? When doing Disneyland or Disney World with a toddler, it is so essential. We had so many things come up during the day, but staying patient and flexible helped tremendously! The night before Disneyland we stayed at our hotel, and planned to get there early for the rope drop. Maybe it was being in a strange environment, but Charlie had her first night of not sleeping in a LONG time. She was up for 3 hours in the middle of the night, and finally fell asleep around 5 am. 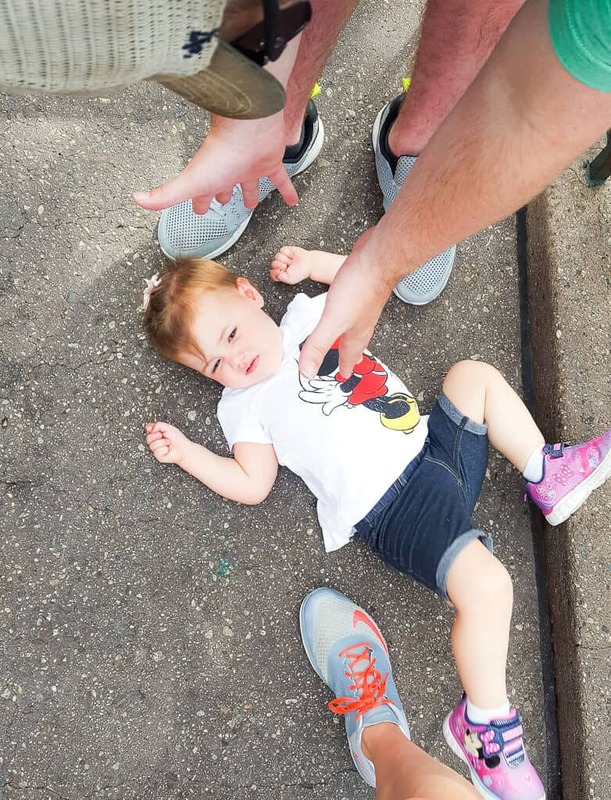 Not only was I exhausted, but I knew if I woke her up for the early rope drop festivities we would be facing a tired toddler all day—not what we needed at Disneyland! We ended up taking our time and still got there right as the park was opening. Later on, she informed up that she was not a fan of seeing characters up close. So there went all of the cute photos I had hoped for. She was so funny, chasing down the characters but then shy or running away once they were ready to say hi! She also had zero interest in waiting in line, even for 20 minutes, and spent lots of time laying on the ground when in the queue. We took it all in stride and just let her do her thing, and honestly, avoided meltdowns by just not pushing her! We also had some other issues with ride closures after getting our FastPasses, but it turns out it led to us getting more FastPasses than expected and riding rides we couldn’t get a FastPass for originally, like Star Tours! Disney is the most family friendly place to go, but they really make it a point to show that families are welcome and provided for. Take some time to research the in-park amenities, and use them to your advantage on your day at Disney. There are Baby Care Centers for nursing, diaper changes and preparing foods, free water at concession stands, stroller rentals, and toddler-friendly play spaces around the park. Our favorites were in ToonTown! One of the best decisions we made for our day at Disneyland was to invite my parents along for the fun! Charlie loved spending the day in the park with her grandparents, and they took so much delight in seeing her experience it for the first time, just like they had with me and each of my siblings as we were growing up. Honestly though? It made it SO MUCH easier having them there! We got to experience all of the magic of the park, both with Charlie and with adult-friendly rides. Two extra sets of hands meant I spent more time walking leisurely in the park and less time pushing the stroller, and more people to chase after our energetic toddler! They even offered to take Charlie back to the hotel at night so my husband and I could have some time to enjoy the park to ourselves. 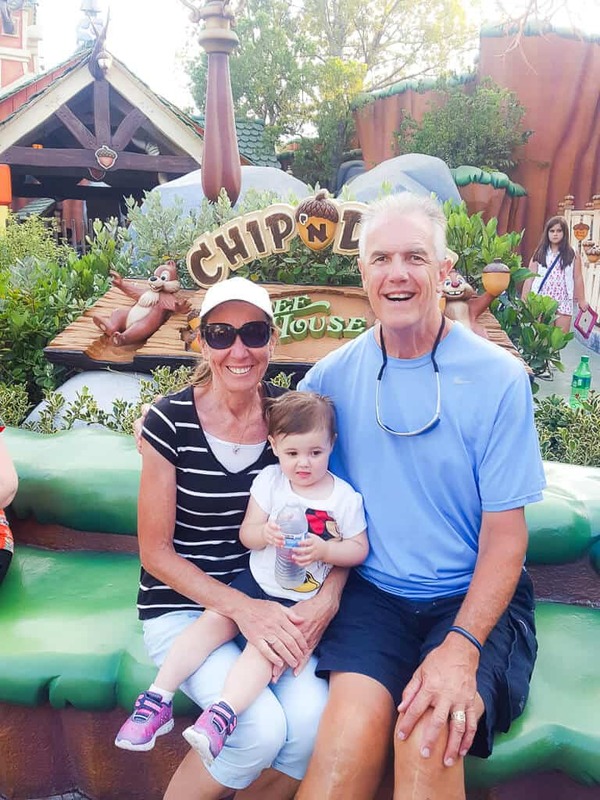 Charlie ended up falling asleep in her stroller, so I convinced them to stay and my mom happily sat with her snoozing granddaughter while my dad joined us on lots of rides as the park was closing. If you have the opportunity to bring family or friends with you, I highly recommend it! 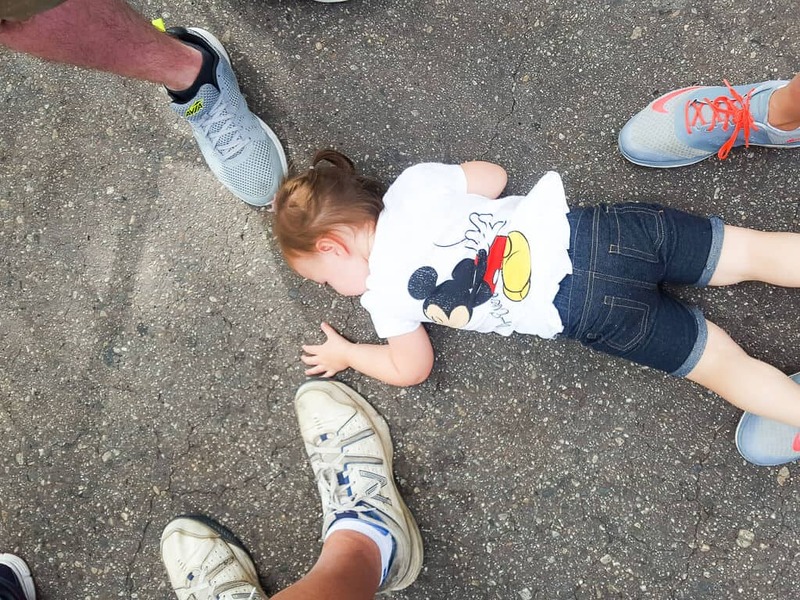 Should You Take Toddlers to Disney? Absolutely! 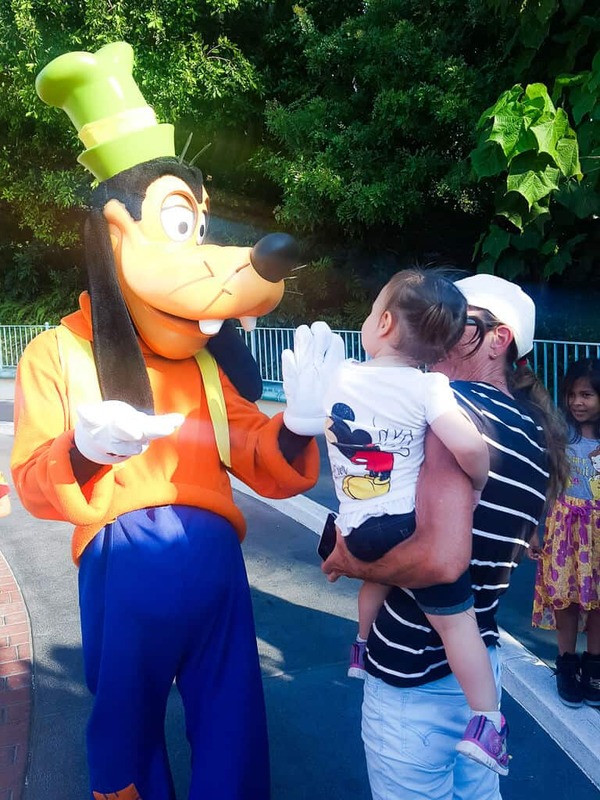 Our single day at Disneyland with a 20-month-old went even better than I could have imagined. 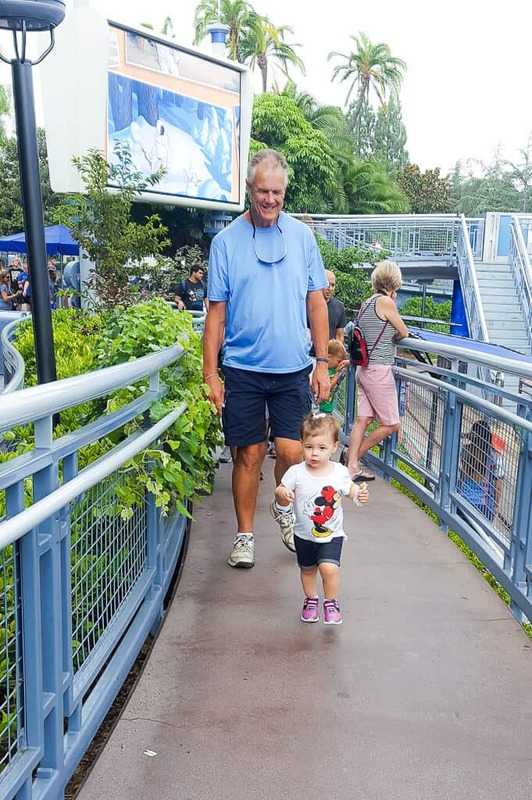 Yes, she got scared on some rides I forgot to research, and there were times we passed up some of my favorite rides to just enjoy the park or try to hunt down her favorite character, but that is what Disney with toddlers is all about—making magical memories and having fun as a family, together. 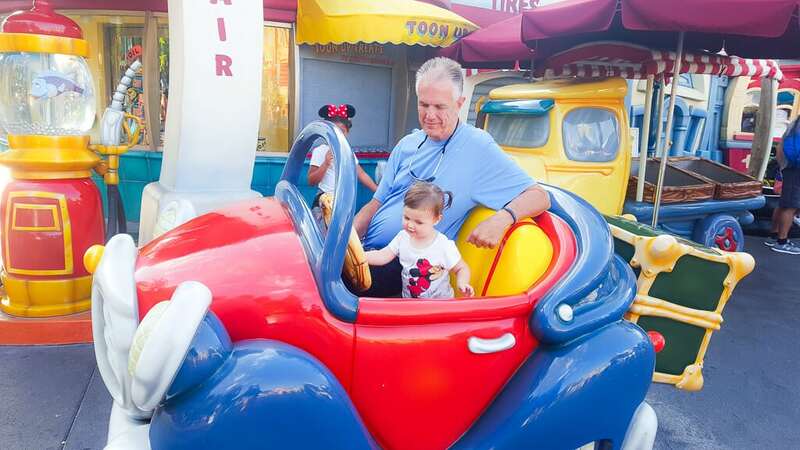 While some people may say to wait until a child is a little older and more aware of what is going on around them, I think there is no wrong time to take an infant or toddler to Disney. Each stage of their development will bring an exciting outlook to the day, and will allow you to find new treasures in the park that you may not have noticed before! If you are headed on a vacation to visit Disney, check out these tips for packing with a baby too! 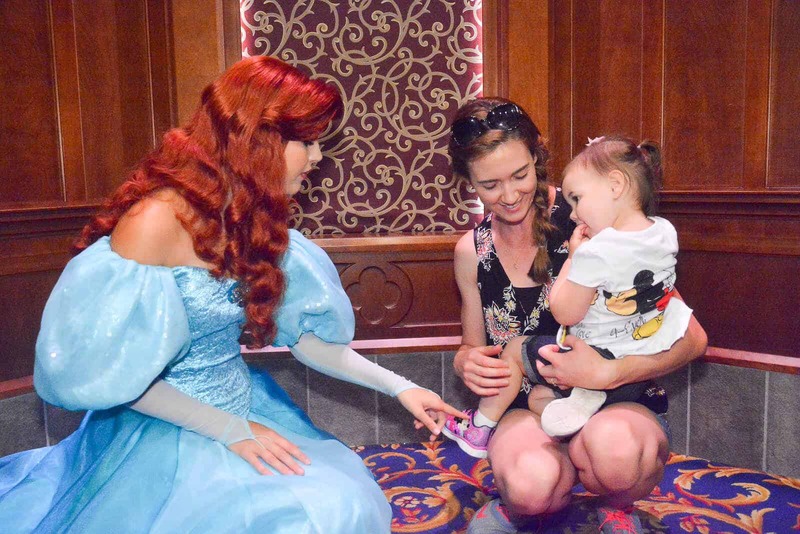 Do you have any tips to share with other families looking to go to Disney with an infant or toddler? Please share them below!